This sly fox won’t get past anyone. 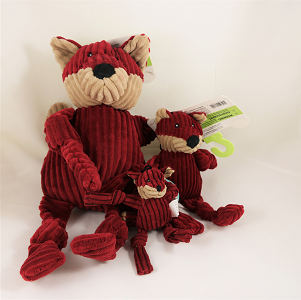 This best-selling corduroy plush animal is knotted at the limb, great for chewing. But don’t be fooled, this fox is made of tough stuff. It’s called Tuffut Technology. It’s a unique construction with three layers making it strong and machine washable. No matter what the size, this fox remains adorable. It comes in three sizes perfect for your dog. Large: 14.5" x 7.5" x 5.75"
Medium: 9" x 4" x 3.75"
Small: 6" x 2.5" x 2.75".